This 57ft Island Boatworks built at the Hatteras shipyard was completely overhauled in 2018, and cruises at 32 knots. Experienced Captain Mitch Pierson is at the helm, assisted by mates José and Koala. 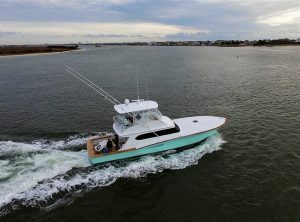 She has a 17-foot beam, three staterooms, two baths, full galley, three fighting chairs in the cockpit, Rupp outriggers, live well, a full range of tackle from 20 t0 130lbs, Shimano and Daiwa custom-built rods, along with VHF radio, digital depth sounder, fish finder, GPS and all the required safety equipment. The boat can be chartered for multi-day overnighters to distant offshore FADs and Sea Mounts for an exceptional sportfishing experience.